That’s the Cake offers a variety of cake flavors, icings and fillings. They’re as simple as Wedding Cake all the way to our Award Winning Mocha Praline accompanied by rum liquor buttercream filling. If you haven’t decided on a birthday cake or wedding cake be sure to find a design that fits your specific event. Our cakes are delicious, decadent and made with several cups of love. We also accommodate preparation of personal recipes upon request, depending on the complexity of the cake in general and time constraint. Our buttercream is made on site from a recipe derived from Nancy’s favorite Aunt Dessie all from scratch. That’s The Cake Bakery’s buttercream is the best in DFW, come by and try it with any one of our cupcakes. All cakes are smoothed to perfection with beading and writing, if requested. Cakes can be customized for any type of event. Custom decorations such as specific icing color, polka dots, bows, drawings and shapes are available too. 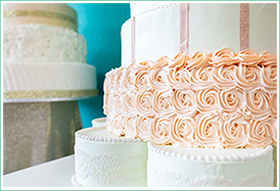 Cakes that require carving or construction are priced during a consultation. A 50% non-refundable deposit is required to place any order.